Chicago Bicycle Accident Lawyer | Illinois Bicycle Lawyers at Keating Law Offices: Plug for De Fietsabriek - "The Dutch Bicycle Factory"
Plug for De Fietsabriek - "The Dutch Bicycle Factory"
I was walking to a bike shop yesterday for some parts, when I came across the De Fietsfabriek shop on North Wells Street in Chicago's Old Town Neighborhood. The owner, Jon Lind, was in the store and I had a chance to talk bikes and about De Fietsfabriek. De Fietsfabriek in Dutch means "the bike factory." It is a company out of Amsterdam that makes extremely high quality bikes that are incredibly functional and utilitarian. 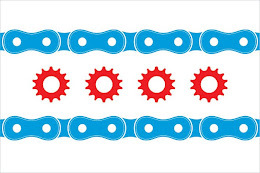 The store in Chicago is currently the only De Fietsfabriek store in the U.S.A. Check the bikes out on the web or stop by the store. I think there is a definite marketplace in the U.S. for bikes of this quality and this useful. They make so much sense that I find it hard to believe it won't succeed. They are also amazingly kid friendly and much safer and secure than some of the other kid-transport contraptions on the marketplace.